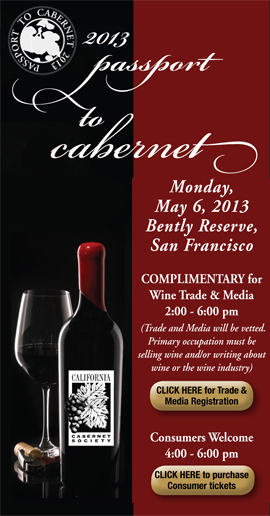 ONCE-A-YEAR opportunity to taste wines from the California Cabernet Society member wineries. This event is an even rarer opportunity for CONSUMERS to have a first glimpse of the character of the 2012 cabernet vintage. Furthermore, you may also taste over 100 of the newest releases from our exclusive member wineries, while speaking directly with the actual winemakers and winery principals. Each spring the California Cabernet Society holds this major Barrel tasting, Passport to Cabernet, showcasing barrel samples from the most recent vintage...201. This is a tremendous and rare opportunity for consumers to taste and evaluate the promise and excitement of the newest harvest from our 65 member wineries and their potential to develop into outstanding finished wines...and don't forget the 100 latest release wines from our Napa/Sonoma member wineries. Gourmet appetizers will be served as well. We look forward to seeing you there. Cheers!